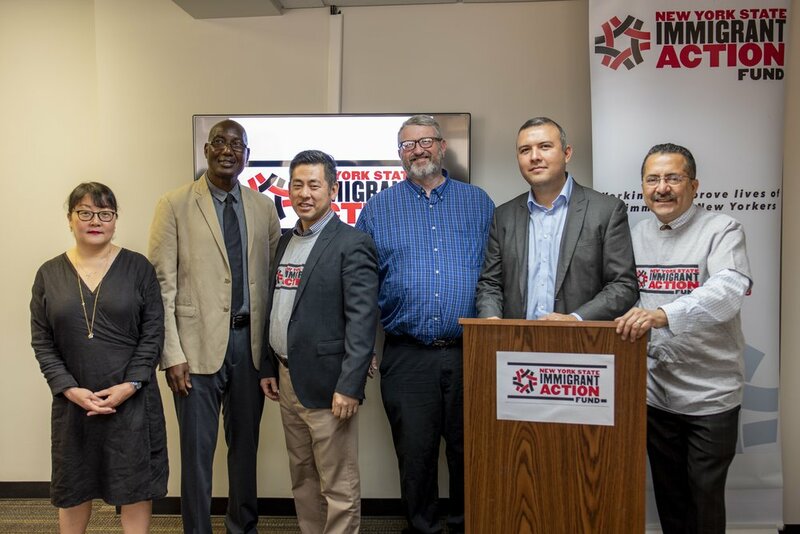 NEW YORK, NY — Today, Immigrant Action (New York State Immigrant Action Fund), one of the largest 501(c)(4) immigrant rights groups in the country, endorsed Reps. Nydia Velázquez, Joseph Crowley, Grace Meng, and Hakeem Jeffries for Congress. These four candidates have been powerful advocates for immigrant rights, and are always at the frontline of the resistance. At a time when our immigrant communities are under constant attack, it is more important than ever to elect local leaders who will take a firm stance by our side. Immigrant Action is proud to support candidates like Nydia Velázquez, who was the first to arrive at JFK in response to the enactment of Trump’s Muslim and refugee ban; Joseph Crowley, who has been serving and advocating for one of the nation’s most diverse communities for years; Grace Meng, who has been a key player in our fight against the troubling changes to the Census; and Hakeem Jeffries, who has forcefully pushed back against the Trump administration’s deportation efforts. These four candidates uphold the values that we stand for and will be critical allies in pushing an immigrant rights agenda forward. “Our communities need national leaders like Nydia Velázquez, who has proven time and time again to be a champion of immigrant rights. In addition to her advocacy for DREAMers and TPS recipients, she has also demonstrated her dedication to highlighting the huge economic contributions of immigrants through her work in the Small Business Committee,” said Lucia Gomez, Immigrant Action Board Member. “We are proud to support Joseph Crowley for re-election because he has spent his time in Congress supporting us and our issues. He has worked tirelessly to pass a clean DREAM Act, support TPS recipients, and, ultimately, protect families from being torn apart,” said Manuel Castro, Queens Lead Immigrant Action Organizer. “Through her work, Grace Meng has proven to be a great defender of all immigrants, regardless of their status. She was the first to raise the alarm on the Trump administration’s toxic changes to the 2020 Census, and has continued to support us as we fight back on the inclusion of a citizenship question,” said Bakary Tandia, Immigrant Action Member. “Hakeem Jeffries was a critical advocate against the Trump tax bill and has fought back against the administration’s deportation efforts. From standing up for immigrants to standing up to the FCC when it made its unconscionable decision to end net neutrality, Congressman Hakeem has proven to be on the right side of the issues that matter most,” said Deepa Patel, Immigrant Action Board Member. "Especially now, we must be united in standing up for immigrant communities and opposing Donald Trump's hateful, anti-immigrant rhetoric and policies," said Congresswoman Nydia M. Velázquez (D-NY). "I've been fighting this battle on multiple fronts. I've authored legislation to create a path to citizenship for Temporary Protected Status recipients who are here seeking refuge from natural disasters or political violence. I continue pushing the House Leadership to finally pass a clean DREAM Act, making DACA permanent, and protecting our young Dreamers. And, I will continue opposing any funds for Donald Trump's useless, hateful border wall and fighting to stop his Muslim Ban. On every single one of these fights NYSIAF, has a been a stalwart ally, in the trenches with us, helping advance a progressive agenda. I'm proud to have their endorsement and look forward to continuing working with them on behalf of New York's immigrant communities." “Immigrants who come to the United States seeking their version of the American Dream are consistently some of the bravest, brightest, and best people I meet. As the son and grandson of immigrants, I’m truly honored to receive New York State Immigrant Action Fund’s endorsement and support. Together, I know we’ll be able to reverse the hateful and discriminatory policies that have been targeted toward immigrant communities this past year. We will continue to fight until DREAMers are protected and comprehensive immigration reform is a reality. We will expand health care access and educational opportunities for immigrants and we will ensure that everyone, regardless of their background, has the opportunity to succeed here,” commented Congressman Joseph Crowley. “The New York State Immigration Action Fund is a voice for diverse immigrant communities across New York, and I’m proud to receive their endorsement. I look forward to continuing to work with Immigrant Action and its sister nonprofit the New York Immigration Coalition to advocate on behalf of all immigrants and New Yorkers,” shared Congresswoman Grace Meng. Immigrant Action was originally formed in 2009 as a sister organization to the New York Immigration Coalition (NYIC), a 501(c)(3) coalition with 200 member organizations across New York State.